World Ethnic Music Ensemble, formed in 2009, is a unique combination of music and musicians from different parts of the world. Fakhroddin Ghaffari is a Master Iranian percussionist and musicologist who specialises in the percussion traditions of the Middle East and India. His mastery over percussion has brought him to the same stage with many internationally renowned artists, such as Abida Parveen and Hans Raj Hans, and has performed on MTV India’s Coke Studio. The ensemble features renowned musicians representing different classical traditions from around the world. 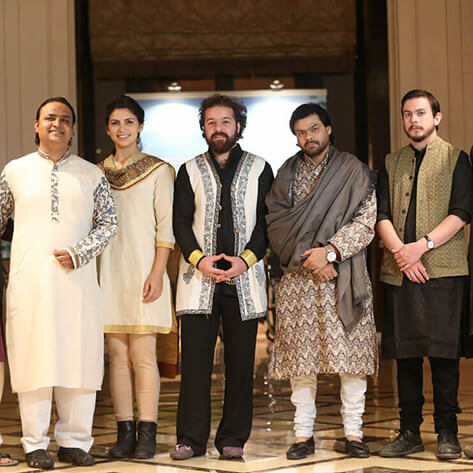 The ensemble includes: Fateh Ali Khan on Sitar (India), Sultan Masood on Violin (Afghanistan), Loic Sanlaville on Guitar (France), William Rees (UK) on the Afghan Rubab and Nawahineokala’i Lanzilotti (US) performs on the cello. Mohit Lal (also a member of the band Advaita) plays Tabla and rounds out the percussion section of the ensemble.